Our accommodations allow you to choose between sleeping beneath a roof of stars, in our traditional Indian Teepees or modern cabins. Meals are home-cooked and served family style featuring our ranch raised beef. Relax around a campfire next to the creek or jump right in. 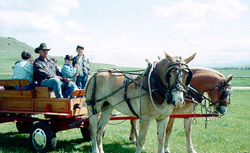 Guest will have free time to explore our truly spectacular Montana scenery. Western style adventures at the perfect spot for a brief escape from the real world. We do not have a fancy dude ranch, no cement pool or hot tub, no TV or public phones. We limit our guests to twelve so we may be able to provide you with a more personal experience. At this time, we do not have activities suitable for children under 10 years old. No pets please. Wagon rides and horseback rides by the hour. We also have sleigh rides followed by hot chocolate and cookies or a steak dinner. One day stay packages available. Directions: Pass Creek Angus Ranch is located one mile south of Wyola, Montana at the foothills of the scenic Big Horn Mountains on the Crow Indian Reservation. Just 30 minutes from the famous Custer Battlefield. We are blessed with the meandering waters of Pass Creek at an elevation of 3,700 feet with the surrounding mountain area rising to 13,000 feet.